Welcome to the TELLA QUALLA BOUNDARY Chapter Website! For more than 40 years TELLA QUALLA BOUNDARY has been delivering excellence in service to the Button Gwinnett District of the Atlanta Area Council. 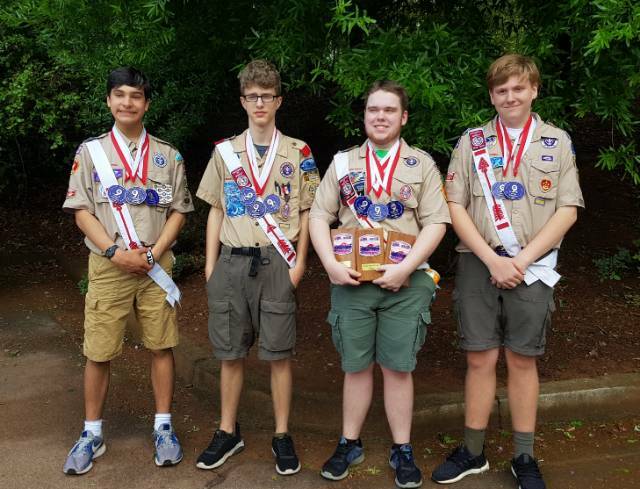 The Brothers of TELLA QUALLA BOUNDARY provide special outdoor event services such as organizing and running Camporees and other District Events as well as performing ceremonial services such as Arrow of Light and Boy Scout Crossover Ceremonies. The Brothers of TQB also provide community services and fund raising for charities. If you're interested in learning more about TQB, click on the Contact Us link on the Menu bar to request more information. TQB stands for Tella Qualla Boundary and “Top Quality Boys” who proudly and cheerfully provide service to others. In lower level behind the building. This site contains the personal content of Tella Qualla Boundary Chapter and is reflective only of the individual members' personal views, thoughts, and opinions. This site does not have the endorsement of the Boy Scouts of America, and it is not an official communication channel of the Boy Scouts of America. Have you paid your 2019 dues? No better time than now! Scan the QR code to find the log on page to pay your dues! Just a reminder that the registration deadline for the Woodruff induction weekend is this Monday, April 22nd. Some Great Awards for Catapults, Tomahawks and Fellowship! Have you finished your awards for Catapults, Tomahawks and Fellowship? Here are some outstanding awards created by event chiefs and presented at our last chapter meeting. The bar is high for our other station leaders! Honor Ceremony Team at Conclave! Chapter Meeting and Service Project this Sunday! Both the service project and meeting are this Sunday, April 14 from 3-5 @ the Masonic Lodge. Please bring your area awards for Catapults, Tomahawks and Fellowship as I will be collecting them. If you did not go to conclave, then you will need to bring me a copy of med forms to update the Chapter med book at April 14 meeting. Please complete the Google Form below if you are planning on attending Catapults, Tomahawks and Fellowship as a STAFF Member. This will allow me to determine the number of Staff we will have for the weekend. Submit one form per person atttending. Catapults, Tomahawks & Fellowship Extravaganza!